Dartmouth Computer Scientist Hany Farid has new evidence regarding a photograph of accused John F. Kennedy assassin Lee Harvey Oswald. 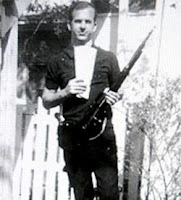 Farid, a pioneer in the field of digital forensics, digitally analyzed an iconic image of Oswald pictured in a backyard setting holding a rifle in one hand and Marxist newspapers in the other. Oswald and others claimed that the incriminating photo was a fake, noting the seemingly inconsistent lighting and shadows. After analyzing the photo with modern-day forensic tools, Farid says the photo almost certainly was not altered. “If we had found evidence of photo tampering, then it would have suggested a broader plot to kill JFK,” said Farid, who is also the director of the Neukom Institute for Computational Science at Dartmouth. “Those who believe that there was a broader conspiracy can no longer point to this photo as possible evidence.” Farid added that federal officials long ago said that this image had not been tampered with, but a surprising number of skeptics still assert that there was a conspiracy. The study will appear in a forthcoming issue of the journal Perception. At a casual glance, the lighting and shadows in the Oswald photo appear to many to be incongruous with the outdoor lighting. To determine if this was the case, Farid constructed a 3-D model of Oswald’s head and portions of the backyard scene, from which he was able to determine that a single light source, the sun, could explain all of the shadows in the photo. “It is highly improbable that anyone could have created such a perfect forgery with the technology available in 1963,” said Farid. With no evidence of tampering, he concluded that the incriminating photo was authentic. ”As our digital forensic tools become more sophisticated, we increasingly have the ability to apply them to historic photos in an attempt to resolve some long-standing mysteries,” said Farid.